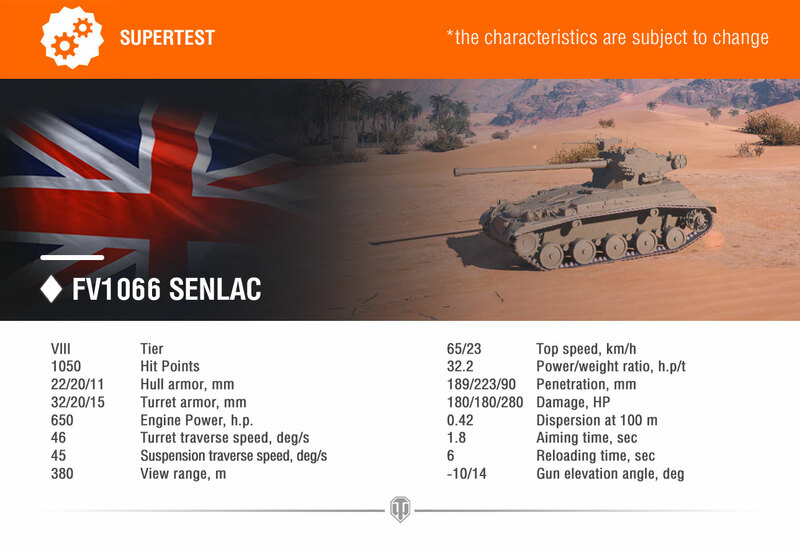 Today marks the start of the Supertest for a new Premium British Tier VIII light tank: the FV1066 Senlac. What’s so special about it? Well, It's got some interesting characteristics. 1. The turret of this vehicle is at the rear, yet it’s a well-rounded light tank with a top forward speed of 65 km/h and a top reverse speed of 23 km/h. 2. The Senlac’s gun has good armor penetration (189 mm with a basic round), small aiming time (1.8 seconds), and decent stabilization. Still this tank cannot excel as a sniper because of low accuracy (the dispersion is 0.42 m at 100 meters’ distance). 3. The Senlac’s HE shells deal 280 points of damage. They have 90 mm of armor penetration, making the Brit a real scourge of enemy vehicles with thin armor. The HE shells fired by the Senlac travel at the same speed as basic rounds (1020 meters per second) which means they are way faster than HE shells of other tanks. With the powerful HE Shells and solid mobility, it looks like the Senlac is shaping up to be an excellent counter to Wheeled Vehicles. It also has a 3-seat Crew Configuration. Please note that the vehicle’s stats aren’t yet final and may change depending on the test results. OOOhhhh, British light tonks. This one kinda looks funny and decidedly ho-hum and the depression is nice but 14 up will find a lot of slopes you're going down being difficult to lay the gun on if they are above or on the flats while going down a hill. This does mean more content and a new line, so yay! There's some really awesome British light tanks that can be had to make a line. So colour me happy. I was just talking about you behind your back. Anyway, what in heck is a Senlac --- the monster from Star Wars ? Edited by YANKEE137, Apr 12 2019 - 20:49. C-3PO: You will therefore be taken to the Dune Sea and cast into the Pit of Carkoon, the nesting place of the all-powerful Senlac. In his belly, you will find a new definition of pain and suffering, as you are slowly digested over a thousand years. Senlac Hill is the ground defended by the English soldiers at the battle of Hastings. 1066 and all that. Edited by Volcanic_lobster_220, Apr 12 2019 - 21:11. So this thing is the answer to the situation of wheeled vehicles being too fast and near impossible to kill. Create the problem and then sell the solution. Well played Wargamming, well played. A dairy based protein laxative supplement? Not with 0.42 dispersion it isn't. Interesting to see the trend of the high-pen HE becoming more common. Will this become a standard feature at some point in the future? Not a bad thing thing in either case, in fact I like the idea that armor's purpose is to reduce the threat of HE rather than to offer invincibility from AP. but just to throw it out there I'd love to see some more light tanks with high DPM and carry potential. This is a hard pass for me unless they offer it for a gold price. No more money from me since they added wheelies to the game. Thanks for ruining competitive play once again. Next months marathon tank? Not complaining, just curious. Might be another marathon tank but since it's only in supertest it wouldn't even be available for that for several months. This is awesome. Signals that British Light Tanks are coming to the game!